Fancy a new background image? Click here to engalactinate and create a new desktop for yourself. 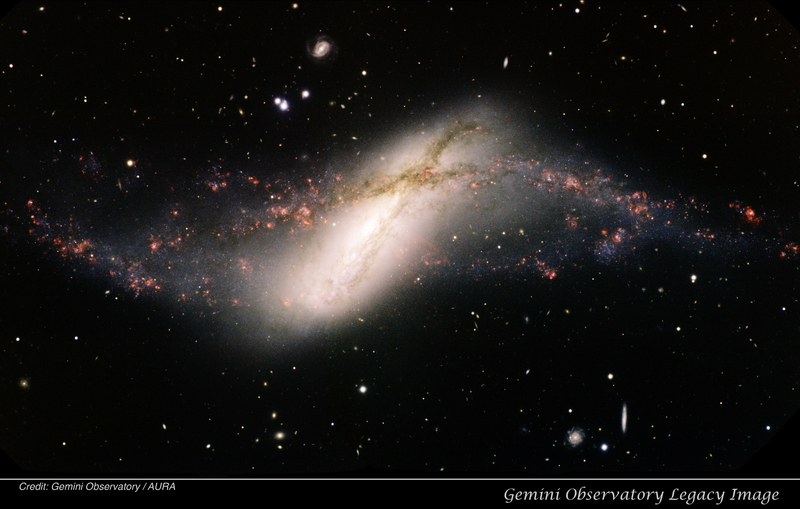 NGC 660 was captured with the Gemini Multi-Object Spectrograph on the Fredrick C. Gillett Gemini North Telescope atop Hawaii’s Mauna Kea volcano. How these gossamer rings around their host galaxies form mystifies astronomers. One current model pits one galaxy piercing the heart of another galaxy. The enormous tidal tug of gravity strips stars and gas and scatters them into the huge ring. NGC 660’s ring extends across 40,000 light-years. As a bonus to the awesome display of galactic tug-of-war, pan across the dozens of faraway background galaxies. Another bonus is the story continues with tales of galactic violence and dark matter. Check it out here. NGC 660 is in Pisces, the position is 01h 43m 02s +13° 38′ 34″. It was discovered by William Herschel in 1784. Its visual magnitude is 11.4v and is visible in 15cm telescopes. The second link is well worth a read: It’s very interesting—and well written. Elegance and beauty, splendor and glory—from “train wrecks”, and “bloody aftermath”s? Violence—a destructive tearing-down; not a constructive building-up—causing renewal? Those, and other characterizations are annoying–and, perhaps, misleading. Perhaps I am in the dark, and from its “scientific” reason, blind. Is there really “death” from struggle and conflict, still suspended, in these heavenly portraits frozen in time? Or rather, or are they visible forms of vigorous transformation, profiled stages of dynamic growth? “Evolution of galaxies”, as would be more commonly stated in line? A Chaotic “collision” in past space? Or, a graceful choreography of dancing embrace? How many stars were actually shattered in these slow-passing movements of gravity’s waltzing turns? How many are left cold in darkness from its hold? Do galaxies expire—in these warming processes, from flowing passages in time? Or are they reinvigorated with new rhythmic life—reborn in bright motions of heated rhyme? Encounters of strangers in the night, through movements of regulating metronome, reemerge a symphony minuet, magnificently joined as one whole. From stately courtship spin, settled: a beautiful union by glittering ring!